Hour 1: OPEN DISCUSSION (Calls Invited) – What’s Ahead in 2015? Joining Amerika Now during the second hour is the World’s #1 Coach of Champions, Jim Fannin, who will be discussing How to Keep Your New Year’s Resolutions in 2015. “Forty-five percent of American adults make one or more New Year’s Resolutions, but only eight percent successfully keep them,” says acclaimed Change-Your-Life Coach Jim Fannin. Tonight, Jim will offer tips to create easier-to-keep New Year’s Resolutions as well as suggest four ways to increase the odds that you will keep them by working backwards from the goal, turn the path into a plan, stay future-focused, and use the day’s first and last 90 seconds wisely. Author and consultant Jim Fannin is the World’s #1 Coach of Champions, having coached more champions – in sports, business and life – than anyone on Earth. As a mental performance coach to some of the world’s top athletes and most successful company CEOs, he has been called the “Change Your Life” Coach. His thought management system has transformed tens of thousands of people’s lives by teaching them to reduce and manage their thoughts – putting them in a “Zone” mindset. He is the founder and creator of the S.C.O.R.E. Performance System, the leading peak performance program. Drawing from his 30-plus years of experience in sports, education, and business, Jim helps people from all walks of life become more successful by showing them how to attract the Zone mind-set. Fannin was born and raised in the Appalachian town of Ashland, Kentucky, where his father was a government worker and his mother a nurse. His love for tennis led him to a full scholarship at East Tennessee State University, where he became the Ohio Valley Conference champion. After he earned a degree in marketing and psychology he played on the men’s pro tennis tour in Europe. Upon leaving the tour, Jim coached seven players in the world’s top 10. Client Adriano Panatta told him about his French Open victory, “It was amazing . . . I was so locked in and so in the moment . . . I had a feeling nothing could go wrong. The ball was as big as a grapefruit. I wish I could bottle it.” At that moment, Jim knew his purpose in life was to find a way to bottle this Zone phenomenon and share it with others. In 1977, Jim founded S.C.O.R.E. Performance Systems, Inc. Since then, he has studied and perfected the System into the leading formula to help people live, work, and play in the champion’s mind-set called the Zone. 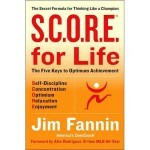 Jim is the author of Score for Life and Pebble in the Shoe and is the creator of the 90-Second Rule Thought Management System. For more information, visit https://90secondrule.com and https://www.jimfannin.com/. Joining the show during the final hour is award-winning author, Ted X speaker, barrister and international environmental lawyer Polly Higgins, who will discuss her latest book, I Dare You to Be Great which advocates a new approach to preventing the destruction of our planet. Hailed as one of the top 10 visionaries in the world by The Ecologist for her work advocating a Law of Ecocide, she’s also the author of Eradicating Ecocide and Earth is Our Business. I Dare You To Be Great explores Polly Higgins’ story as an Earth lawyer as she discovers how we can create a legal duty of care for the Earth – a law of Ecocide. We have a choice: break our chains and create a greater freedom, or remain enslaved to an era of Ecocide. Polly invites in a conversation of a different kind; firing up a neural pathway of exploration that takes us into the unknown yet expands our vision of what our legacy could be. Sharing her insights, she sheds a light on what is possible – a vision far greater and more beautiful than we have dared before. Greatness is a quest: one that speaks to all of us. By daring to be great – rediscovering how to use the creativity, passion and power that lie within us – we can find freedom and inspiration to break the cycles of harm playing out in our world. This is the message of a new and inspiring book by prizewinning author Polly Higgins. Listen in as Polly discusses how we can use the creativity, passion and power within us to co-create a better future for ourselves and our planet Earth. For more information, visit https://pollyhiggins.com.